Everyone knows a real estate agent. You may know a part time agent who occasionally works in real estate, sells homes to family, or works in real estate part time while they take care of their children or do another job. While it may seem like a good idea or a charitable gesture to use your friend or family member to buy your new home, not using an expert can be financially hazardous. 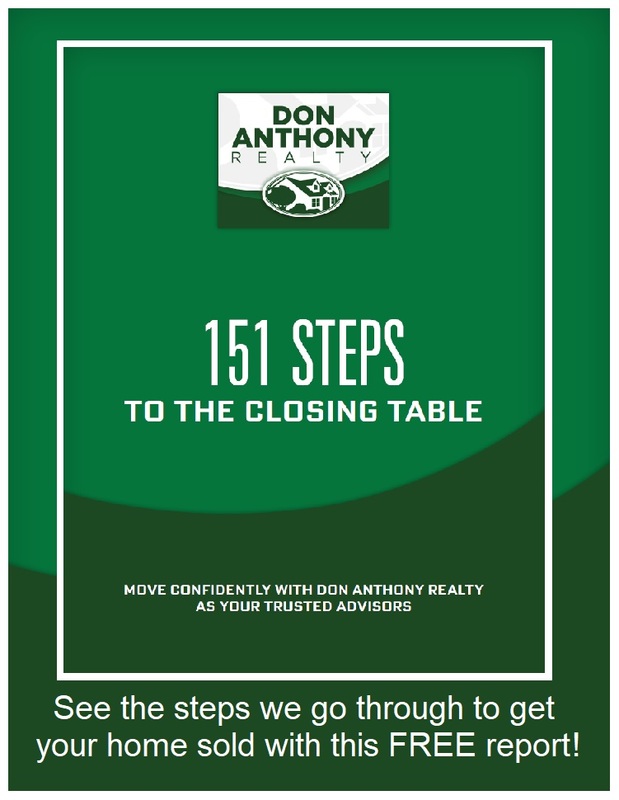 At Don Anthony Realty, we see a large number of contracts a year. The majority of contracts that come across our desks are contracts in which we represent the seller. This knowledge of how the Seller negotiates, what they want, and how they structure their offers gives us excellent insight on how to strategically negotiate for buyers. Our buyers save money on financing, immediate out of pocket closing costs, and the sales price. There may be things that are important to you other than the sales price, such as the closing date or having the Seller participate in a financial program like VA or FHA. Whatever your need may be, Don Anthony Realty will help you get the home you want, the terms you need, with the service you deserve. We Take You Step by Step Through The Buying Process, Avoiding Client Confusion, While We Are Using Our Secret Formula to Get You The Best Deal Possible. Help You Get A Loan — We have lenders that we highly recommend that can help you get the best terms and interest rate. Help You Find Properties To See — We give you our tools for searching for properties that meet your criteria. Get You Into Properties Quickly and Efficiently — We have a backstage pass when it comes to getting into homes and seeing as many homes as possible in the shortest amount of time. This will help you make a better buying decision. Give You Advice About The Property And What You Should Be Considering About Its Resale — We play Devil’s Advocate, not Cheerleader. Compare Houses To Others On The Market — We use all of our tools in order to compare the houses to make sure that you are getting the best deal. Get You Into a Legally Binding Contract With A Seller To Protect Your Rights — We dot all the “i”s and cross the “t”s. Investigation Process — From looking at the Seller’s Disclosure to understanding the addendums of a bank, we are there to work through the process with you. Negotiation Process — We take you through the whole contract and negotiation process with expertise to protect your interests. Inspection Process — We take you through the whole inspection process to make sure hidden defects are addressed. Closing Process — We take you through the whole closing process so you walk away with the keys the home you’ve been looking for! Help You Understand The Checkpoints and Process of Buying — We educate you to help you avoid Buyer’s Remorse by taking you step-by-step through the process of buying easily. Purchase and Sale Agreement Presentation — We show you your rights and the rights of the seller in a short presentation full of golden nuggets. We Help You and Your Partner Figure Out What You Are Looking For Exactly With Our Tool — This helps our buyers get on the same page and make sure that they are working together instead of against each other. We Notify You Of Properties As They Come On The Market — You can get daily emails of homes as they come on the market to give you the edge to find your dream home. We Use Our Secret Formula For Getting The Best Deal Possible — We gathered this process from the many transactions that we have done as a team, and our numbers show that we know what we are doing in getting the end result. We Give You A List of What To Take When You Are House Hunting — Our buyers love this list and it gets them organized for the process. We Teach You How To Find The School Scores — Schools are important whether or not you have children. We Give You Questions To Ask The Inspector Before and During the Inspection — This process lets you hire the right person. How To Talk The Neighbors — Neighbors know what we want to know. Know If A Sexual Predator Lives In The Neighborhood — We teach you how to look at any neighborhood that you are interested in. We Work As A Team — When odd situations come up, we have a team of people to discuss the situation with. We work together for the benefit of our clients. Straightforward Guidance & Advice —We are going to tell you what we think to assist you in making the decision that is best for your situation. Service is FREE with no time limits, no pressure and no obligation. We have people to get you a loan – standing by. We have the expertise to help you find homes, show you homes quickly, help you get the best deal possible and work all the angles to keep you protected. If you are serious about getting the BEST price for the home you want, you must work with the best… Don Anthony Realty.